September 30th marks the 63rd anniversary of James Dean’s death. The Hollywood icon made three outstanding movies as a lead actor, East of Eden was one of them. 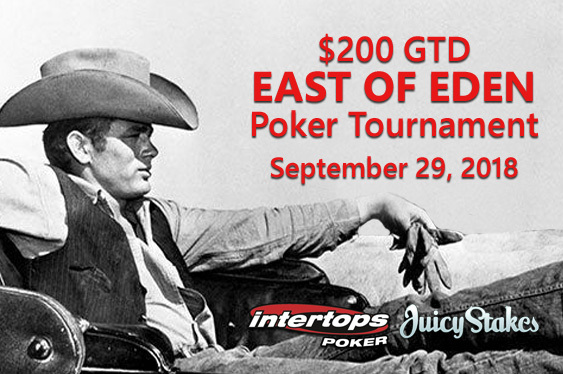 To celebrate the rebel without a cause, Intertops Poker and Juicy Stakes Casino are hosting a $200 East of Eden poker tournament on September 29th. Juicy Stakes Casino -- East of Eden tournament. James Byron Dean is remembered as a cultural icon of teenage disillusionment and social estrangement. The screen adaption of John Steinbeck’s novel East of Eden became famous due to Dean’s unscripted and highly emotional performance. He also starred in Rebel Without a Cause and Giant. Dean’s films have been named by the American Film Institute as one of the best American films of all time. Register for The East of Eden tournament under the Tournaments tab in the poker software.